Early as possible. End. Of. Story. When it comes to booking a cruise for the best possible price, time is everything. Purchase your vacation when the cruise itinerary has been announced. Often, this is approximately 1.5-2 years before the actual sail date. 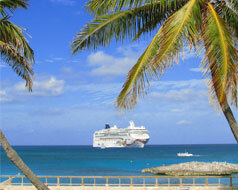 As time gets closer for the cruise to depart, prices often increase. If you are waiting for the price to drop, think again. You may have reservations about booking so early such as “I’m not sure what I’m going to be doing in a year and a half in the future, so can I really set something in stone that far in advance?” Just remember that plans may change when you plan 2 years in advance or 2 weeks in advance. Cabin space: The earlier you start planning your cruise, the more options you have for what type of cabin you want and the location of your cabin. This is especially crucial if you are going with a group of people and you all want to be near each other. The closer you get to the sail date, the less chance you have of getting the cabin you want. Special promotions: Often, cruise lines will offer a special discount such as kids sail free, on board credit for a certain amount, or 50% off the second guest. Better air fare prices: You are more likely to get a lower air fare by purchasing in advance than if you were to buy near your cruise sailing date. Lower cruise fare: When a cruise itinerary is announced, the lowest fare will often be advertised and will continue to increase until the time of departure. There are some instances in which a cruise line has not sold all their cabin space on a specific itinerary, resulting in last minute deals. In this case, cabin space has limited pickings and the flight to get to your cruise departure area may be so high to the point that it counteracts the money you were saving on your cruise. You may end up paying more for your vacation overall, just by booking last minute. If you know where you want to go, when you want to go, and what cruise line you want to be on, then BOOK NOW! If you are hesitant about the price, call a travel agent. There may not be a “magical” day to book a cruise, per say, but the earlier you book your cruise vacation, the better your overall price will be.